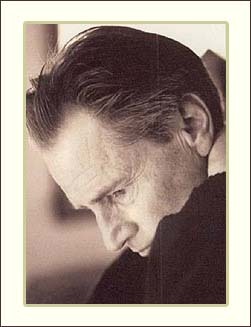 Arriving in New York, Sam Shepard looked, as always, like a cowboy in the city, someone who would prefer to be home on his farm in Minnesota. On this particular day, however, he seemed relaxed and in a salutary mood. He was here not as a playwright or actor, but in a less familiar role as a writer of fiction. He has a new book, ''Great Dream of Heaven,'' a collection of short stories. In common with his plays, these are tales from the frontier of his imagination, richly populated by rascals and renegades. The title story in the new collection is vintage Shepard. Two codgers, widowers who share a bungalow in South Dakota and wear matching Stetsons, fall for the same waitress in their favorite diner. When one has a secret rendezvous with the object of their mutual affection, the other feels betrayed. Mr. Shepard said that he had ''those two characters kicking around'' for some time, but he did not begin to write about them until 1996 when he was in London. ''It was very dreary, rainy London weather, as usual,'' he said. ''London is a great place to write because it makes you want to be out of there.'' That, he said, was typical of his writing habits. He prefers to be away from a place in order to write about it. Many of the stories began between takes while he was on location for a movie. He would write things down in his notebook and then finish the stories in his workroom, a white oak cabin on his farm. His father was a pilot during World War II. A salty reprobate, he never could seem to find his place in peacetime. ''I think he was a mystery to himself,'' he said. ''He was a very complicated man. He spoke fluent Spanish, he was a teacher and a Fulbright scholar. At the same time he was extremely violent and could be quite mad and totally unpredictable and alcoholic.'' He would disappear for long periods, then suddenly reappear, without explanation. Only once did Rogers see a play written by his son, ''Buried Child,'' at a theater in Santa Fe. ''He was stoned drunk,'' Mr. Shepard said, ''and he started yelling at the actors, telling them that what they were depicting was untrue. He knew because he was in the play. And they kicked him out of the theater.'' When he explained that he was the father of the playwright, they let him back in, and he started talking back to the actors again. Mr. Shepard said that although the characters in the play ''are overblown, they're recognizable, certainly if you're part of the family.'' In 1984, Rogers, coming out of a bar, was run over by a car and died. Mr. Shepard said that his mother was also a great influence and ''the opposite'' of his father. ''I think there is a way in which men -- not women so much -- tend to obsess about certain things and go off and become very isolated, very estranged from the people who are close to them,'' Mr. Shepard said. Such thoughts have fortified his feeling about his children. He has a son from his first marriage and two children with Ms. Lange. She took the photograph that appears on the cover of Mr. Shepard's new book, an evocative portrait of him and his younger son sitting at the end of a pier. Looking back on his career, Mr. Shepard said that at 19, he had come to New York vowing to be an artist, without knowing what would be his field of expression: painting, acting, music. While working as a busboy at the Village Gate, he wrote his first one-acts, and the plays began to flow. At first he wrote plays that were like jazz riffs, soon expanding them to embrace folklore and mythology. In what up to now has been the central phase of his career, he focused on the American family with a full house of incendiary plays about conflicts between couples, fathers and sons, and warring siblings. In ''True West'' the two brothers represent two aspects of the author. Mr. Shepard admitted that he identified more with Lee, ''the rougher brother.'' Although it was not his original intention to have actors switch roles in the play, he was gratified by the 2000 Broadway revival, in which Philip Seymour Hoffman and John C. Reilly did exactly that, as two English actors had previously done in London. For the present he has no plans for the theater. As he said, ''I'm not going to write another play until I can enter absolutely new territory.'' Several of his stories are monologues and dialogues and could be staged. ''I wouldn't mind if somebody decided to do them,'' he said.